A bleed is when an interior page has photos, boxes, text, or images that are intended to extend off the edge of the page. Any book that has bleeds will require a special setup to ensure that the image, etc. actually extends completely to the edges. Failure to correctly setup page bleeds will result in thin white lines along the edge of the bleed pages. The illustration below shows InDesign bleed settings. Unlike most software, InDesign allows you to set up a proper interior text page bleed relatively easily. In Document Setup set your document size to the final trim size of the book, then move down to the Bleed and Slug section and setup your bleeds like the illustration below. The top, bottom and outside bleeds should be set to .125” (1/8 inch), and the inside (gutter) should be set to 0. 2. When you are ready to make a PDF, select Adobe PDF preset PDF/X-1a:2001. This setting will convert any RGB images/colors to CMYK and embed all fonts. 3. Under Export Adobe PDF options select Marks and Bleeds on the side menu. Make sure “Use Document Bleed Settings” is selected under Bleed and Slug. Compare your Marks and Bleeds Page to the preview shown here. Make sure no Marks boxes are selected. 4. Select Export. After your PDF is created, please review it carefully. The final PDF dimensions should be the trim width + .125 inch and your trim height + .25 inches. Word processing programs (such as Word) do not have bleed settings. To allow for the bleeds, you will need to add .25 inches to your width and to your height. This will allow for .125 bleed area on all sides. (Example, if you would like a 6×9 book, you will need to make your document 6.25×9.25). 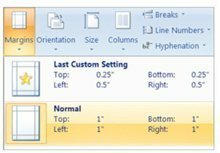 When you change your page size to include the bleed area your margins will also need to be changed to accommodate the bleed. So, if you had .5” margins top, bottom and outside edge, you would need to change them to at least .625”, though 1” might be better. 2. 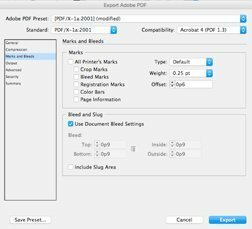 If you are ready to create a PDF and if you have Adobe software installed, click File, then Save As and select PDF in the drop-down menu. 3. After converting your Word document to PDF, check the PDF closely to ensure no unwanted changes occurred during the conversion and that your document is the correct size.